For inspiration, I've been re-reading an old favorite, Bertha Reppert's Growing Your Herb Business . 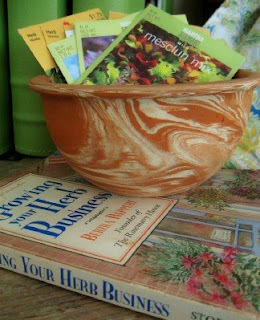 Such lovely gift and hospitality ideas from herbs--for resale or for blessing your friends. Her daughters maintain a Rosemary House blog, which is well worth reading. Enjoying the China Bayles mysteries is as close as I'll come to an herb shop/tea room, but it's always free to daydream! I'll hafta check the book out! Daydreaming is great, I find it very theraputic and it sometimes even gives my creativity a jump start. Oh thank you so much for the new blog! I have this book and it's trashed! But I still keep it for great inspiration. I'm just starting to delve into herb growing myself; thanks for the links. Oh, I must check out these books. I love a good cosy mystery. I'm always amazed and admire people who run a successful home business. I'm one for the day dreaming when it comes to this. Thankfully I'm starting to realize that I do have a home business even though I don't turn a single penny. For me, its teaching my children at home. I do have the mending business but that is more of a charity when it comes down to it! And I spend the rest of my spare time working with various boards in my city trying to improve my community, a political and practical voice if you will. Check out my blog to see you're a blog award winner! I love your blog! I just moved to the same area the Rosemary House is in, small world! Best wishes to you, your family and the new baby!